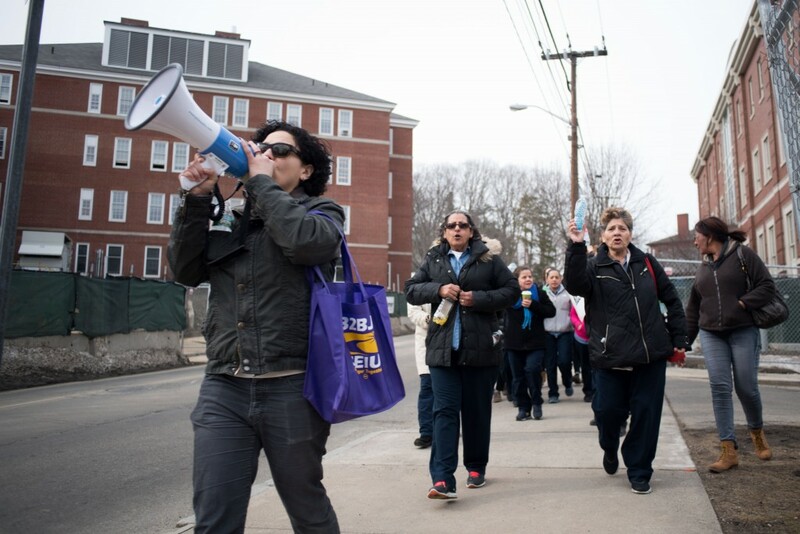 Dozens of janitors and students, as well as two Service Employees International Union (SEIU) representatives, gathered outside of Brown and Brew today and marched down Boston Ave. to Tufts Facilities Services building to protest proposed cuts of janitorial jobs. Protestors marched in a circle outside the building for an hour and a half while Tufts Labor Coalition (TLC) members negotiated with Vice President of Operations Linda Snyder and DTZ administrators. According to first-year Nicole Joseph, a member of TLC, the entire system of shifts and worker responsibilities will be reorganized. DTZ, the company with which Tufts contracts its janitors, intends to increase efficiency by reallocating staff such that they would clean high-traffic buildings more often than those buildings that are used less frequently, she said. This reorganization will result in the cutting of 712 hours of work per week, or approximately 25-35 workers, she explained. This new plan will be enacted on the Medford, Boston and Grafton campuses, she said. In order to initiate this new system, DTZ will create new shifts and allow the janitors to pick their preferred responsibilities based on their seniority within the union, Joseph explained. However, this also means that once all the positions are filled, several employees may be left without jobs, she said. Even workers who are able to retain work at Tufts will have their responsibilities drastically altered, Joseph said. She added that in her interactions with workers, they expressed worries that their work load would be increased. DTZ plans to offer any available jobs at other DTZ-contracted locations to those who are affected by the cuts at Tufts, Joseph explained. However, she emphasized that these replacement jobs are not guaranteed and are likely to be part-time, seasonal jobs that would not provide steady income. Two police officers stood outside the Facilities Services building and did not allow students to enter. Protesters continually circled on the sidewalk outside to avoid being removed from the area because the officers were trying to avoid a large gathering that would block traffic.